I hope this message finds all of you doing well during your first week of classes. 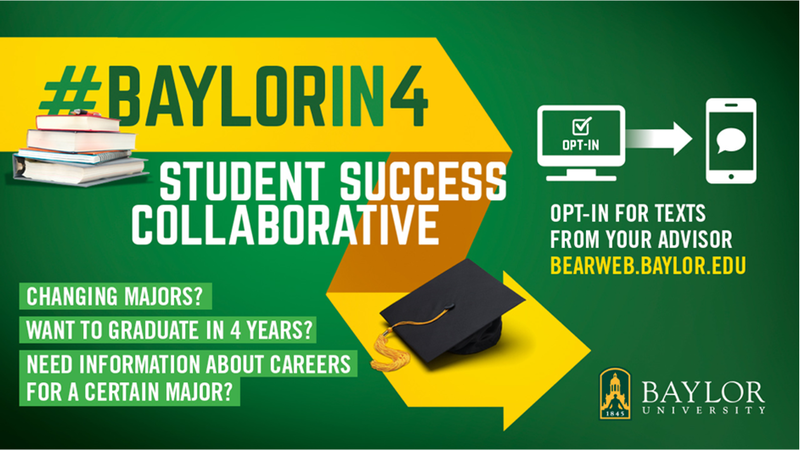 I am writing to let you know of an exciting new effort that Baylor recently launched to help every single one of you graduate in four years. Designed to provide students with better information as they consider possible new majors, the program is called the “Student Success Collaborative” (or SSC). SSC is a predictive analytics software system that draws upon eight years of historical curricular data on Baylor students to help your advisors assist you in the event that you decide to change majors. A smooth transition when changing majors is critical to remaining on track to graduate in four years. In the months to come, you will be hearing more about SSC from your academic advisor (and others). For now, though, I want to draw your attention to one important way that you can partner with us: signing up for text messaging. One important aspect of SSC is that the system allows us to communicate with students through text messaging. You will now be able to receive updates or reminders through text messages and not just through email. We have found that email is effective with some students, but many students, we’ve come to understand, would prefer to receive text messages. To begin receiving text messages, however, students must “opt in” through the Bearweb system. Follow these Success Center Collaborative Opt-in Instructions on how to do so. I ask that each of you please follow these steps so that we can better communicate with you. By opting in to text messaging, you will receive individual texts from your advisor that include simple reminders about your advising appointments, notifications about registration times, information about how best to prepare for advising appointments, and notices about personally applicable services within the Paul L. Foster Success Center. Thanks very much for opting in to text messaging as soon as you can. We are committed to doing everything we can to help each of you graduate in four years, and your partnership with us as we implement the new SSC system is a critically important step in the process. Best wishes for a great conclusion to your first week of classes.